Abstract Body: Introduction: Major technological advances have improved motor function (motor output) of bioengineered prosthetic limbs. However, the ability to provide long-term, distinguishable, graded somatosensory feedback from the prosthesis to the patient has yet to be achieved. Our laboratory has developed a prototype sensory neural interface to create and transmit sensory input to the residual limb, providing high-fidelity sensation through advanced neuroprostheses. Methods: Twelve rats underwent sensory RPNI fabrication whereby the left extensor digitorum longus (EDL) muscle was elevated as a free-muscle transfer to the ipsilateral thigh and reinnervated by the transected purely sensory sural nerve. The entire construct was then encircled with small intestinal submucosa. After a convalescent period of 2 or 4 months, in vivo sensory recordings were obtained proximally from the whole sural nerve while electrically stimulating the sensory RPNI, and compared with directly stimulating the sural nerve. RPNIs, sural nerves, and contralateral control EDL muscles and sural nerves were then harvested for mass and histological comparisons. Results: Upon gross examination, RPNI muscle areas appeared well vascularized, healthy, and viable. Neural responses from proximal sural nerves were successfully recorded, with RPNI-invoked Sensory Nerve Action Potential (SNAP) responses indicating regeneration and reinnervation. Direct RPNI electrical stimulation resulted in contraction confirming muscle health. RPNI muscle mass was up to 95% that of control EDL muscle. Comparisons of electrophysiological responses, muscle mass, and histology indicated muscle and nerve fiber recovery approaching equivalence. Conclusion: These findings demonstrate that freely transferred muscle becomes reinnervated when neurotized by transected sensory nerve, and stimulation of the sensory RPNI successfully initiates and transmits somatosensory signal to the residual nerve. This functional sensory neurotization can be used to provide amputees with the sense of touch. Lay Language Summary: Extremity loss can have devastating physical, psychosocial, and economic consequences for an amputee. Over 1.7 million people in the United States are currently living with limb loss, and this number is increasing by at least 185,000 each year. Upper extremity loss is primarily the result of high-energy trauma in young and otherwise healthy patients, occurring not only from accidental injuries in the civilian setting but also from war-related injuries and unexpected acts of terror such as the recent Boston Marathon bombings on April 15, 2013. Despite modern technological advances, the most widely available upper extremity prostheses provide little functional recovery beyond basic grasping. On the scientific frontier is the concept of a surgically integrated robotic prosthesis driven by an amputee’s own severed nerves. Turning this concept into reality requires the development of a reliable interface that permits the seamless integration of a prosthetic limb with the residual limb of an amputee. Such an interface has the potential to create a true paradigm shift in the treatment of these patients. Our laboratory has developed a regenerative peripheral nerve interface (RPNI), which is surgically fabricated by transferring a free muscle graft to a severed nerve, and attaching an electrode to that muscle which can then transfer signals between the residual limb and prosthetic device. We have demonstrated the viability, durability, and efficacy of this interface for the purpose of controlling a prosthetic device, and are on the cusp of translating this novel and innovative interface technology into humans. The major technological advances in modern prosthetic devices, coupled with the utilization of RPNI technology, holds great promise for improving motor function of prosthetic limbs. With this success, our laboratory has begun investigating a new area of prosthetic technology unavailable in the current market: the ability to provide long-term, distinguishable, graded sensory feedback from the prosthesis to the patient. For this purpose, we have developed a prototype sensory regenerative peripheral nerve interface (SRPNI) to transmit sensation back to the residual limb. This novel interface would serve as a conduit to allow sensors on an advanced prosthesis to transfer this sensory information to the remaining nerves of an amputated limb, thus providing sensation to the patient. To investigate the viability of a sensory RPNI, 12 rats underwent SRPNI construction whereby the left extensor digitorum longus (EDL) muscle was moved from the lower leg to the thigh, and then implanted with a transected sensory sural nerve. The construct was then encircled with decellularized small intestinal submucosa, a scaffold used for structural support of the RPNI. After a period of 2 - 4 months, recordings were obtained from the SRPNIs. RPNIs, sural nerves, and contralateral control muscles and nerves were then harvested for mass and histological comparisons. At examination, RPNI muscles appeared well vascularized, healthy colored, and viable. Neural-evoked responses from SRPNIs were successfully recorded, which confirmed that the muscle was indeed healthy, and the interface capable of transferring sensory signal. Mass of the SRPNI muscle was nearly equivalent to that of control muscle, which provided further evidence of sensory nerve reinnervation. Comparisons of electrophysiological responses, muscle mass, and histology indicated that muscle and nerve fiber recovery approached equivalence. These findings demonstrated that transferred muscle becomes reinnervated and viable with a sensory nerve. 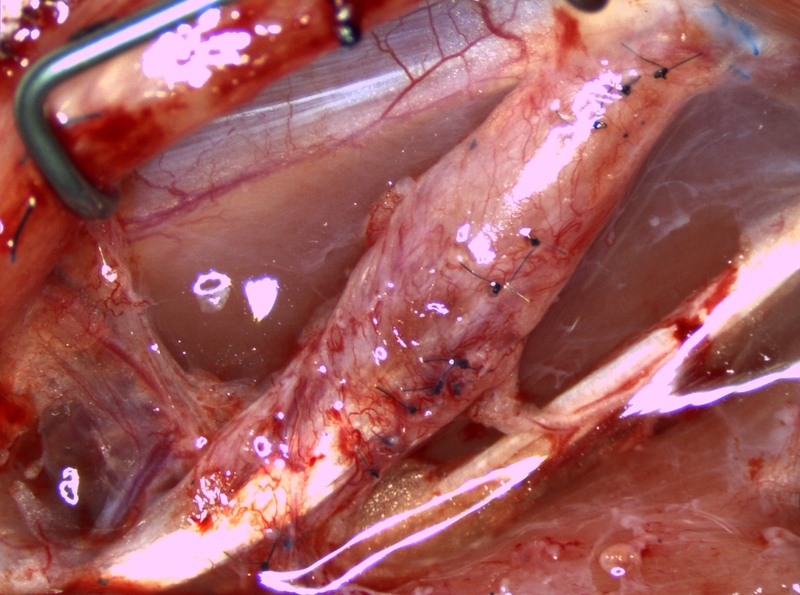 Further, these innervated SRPNIs contract when directly or indirectly electrically stimulated, indicating both healthy tissue and a connection to the remaining nervous system of an amputated peripheral nerve. Through electrical stimulation of this functional sensory RPNI, there is enormous potential for enhancing the recovery and quality of life of thousands of amputees by restoring them with the sense of touch.